"Kupu" Maori noun. Definition/translation into English "Word". In 2009 Weston Frizzell began exploring and remixing the iconography of NZ fine art and popular culture into the letter series, a suite of prints that rearranged letters appropriated from iconic NZ artworks by artists such as Colin McCahon and brands, for example Watties and L&P. The first word prints produced were those perceived by the artists as the most prominent in the kiwiana genre of decorative art, Aotearoa, Aroha and Home. For the second series of word prints the initial intention was to create artworks montaging images of the letter paintings to form a series of words specific to the location of each destination of a touring show. Taupo was the first of this series (in an edition of 10 that has now sold out). The release of today's suite is arranged around a choice of letters specifically restricted to those of the written Maori language again with visual subject matter limited to NZ only. 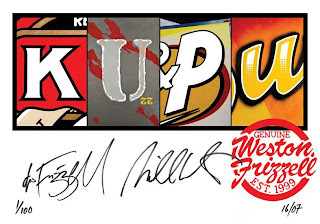 The prints are "Kupu", "Mate", "Pakeha", "Kapow" and "AEIOU". Working backwards from the answer, Weston Frizzell conceived print designs that combine letters from a painted series. The individual letters are realised as 800 x 1200mm painted artworks, then images of the completed paintings were digitally captured, and the files assembled to create the final digital master files. Weston Frizzell regard the final work as not derivative of the painting process. The inverse is true. The paintings are regarded as artifacts of the creation of a digital print! Who is Weston Frizzell? We have written before about differentiating your Frizzells, but in essence Weston Frizzell is the collaborative identity of artists Otis Frizzell and Mike Weston. An experiment in the subversion of brand management theory that has evolved into a successful and frequently controversial art identity (see for example the controversy over their Auckland Supercity logo or Weston Frizzell ask "Who are the real terrorists? "), Weston Frizzell occupy a cleverly conceived niche that is now well established on the NZ fine art stage. All of the Kupu work can be seen at the touring exhibtion of Weston Frizzell prints and paintings produced by Th'ink and The Area, check the show out in Wellington at Thistle Hall, 293 Cuba St 29 July - 4 August 2013 and at the International Visual Methods Conference at Victoria University 2 September to 6 September. Kupu moves to Auckland at Augusto, 90 Wellesley St 20 August to 25 August and then onto Melbourne at Second Story, 159 Sackville St, Collingwood 23 September to October 6th.